The preferred modern method of detailing clan related surnames is now Associated Family Names, which were once called Septs. The founder of Clan MacTavish in Knapdale was Taviss Mor Mhic macCalumn, or, Tavis the Great son of Calumn (or simply Tavis Coir 1) in 12th century Argyll. His ancestors were the Irish MacGilletamhais of Guill and Irgull, what is now Northern Donegal, Ireland, descendants of the Boars Kings in the kin-group of Cenel nDuach of the Kingdom of Guill and Irguill, found in the various Irish annals. The clan lands of Dun an Ard Righ (now Dunardry) in Knapdale, Argyllshire, were given to the MacTavish ancestors in the reign of King Domnall the 2nd, grandson of King Kenneth McAlpin, about 893 AD. The Northern Irish MacGilleTamhais (MacTavish) are noted the descendants of the 2nd century Northern Irish Pictish King, Conn of the Hundred Battles, and the specific familial/lineal connections are noted in the chronicle, Chronicon Scotorum (Chronicon Scotorum – according to Nollaig Ó Muraíle, is “a collection of annals belonging to the ‘Clonmacnoise group’, covering the period from prehistoric times to 1150 but with some gaps, closely related to the ‘Annals of Tigernach‘.) Conn Cétchathach (Conn of the Hundred Battles – literally Conn the hundred Battled) was the son of Fedlimid Rechtmar, and according a 2nd Century medieval Irish legendary and annalistic texts, the High King of Ireland (probably only the northern half). From Conn and his kin group, are descended various Irish and Scottish clans. Ancient Irish Gaelic (Gaeilge or Erse) Spellings of the MacTavish name. The public-at-large should be aware that not all persons of Scottish heritage belonged to clans, nor do they currently. Such is a widely held misunderstanding of Scottish society. It is particularly true that persons with no clan or large family affiliations where inhabitants of the Lowlands and Borders of Scotland. Most inhabitants of the Highlands were indeed clan members, either by blood, or were adopted into the clan as a Sept (Associated Family Name within a clan). Where Scots would say “MacGregor and his Clan” the Irish might say “O’Neill and his Sept”. A sept is an English word for “a division of a family”, especially of a Scottish or Irish family. The word may derive from the Latin saeptum, meaning “enclosure” or “fold”, or via an alteration of “sect”. The term is used in both Ireland and Scotland, where it may be translated as sliocht, meaning “progeny” or “seed”, which may indicate the descendants of a person (for example, Sliocht Brian Mac Diarmada, “the descendant of Brian MacDermott”). Clans and Septs of Ireland, RMK Research. “sept” . Merriam-Webster Online Dictionary. 2008. Retrieved 5 September 2008. Editors of Webster’s II Dictionaries. (2005.) Webster’s II New College Dictionary, 3rd Edition. Houghton Mifflin Harcourt. ISBN 0-618-39601-2. Woulfe Patrick, Fr. (2010.) Irish Names and Surnames. Genealogical Publishing Company. Most Lowland or Border clans more often called themselves “Houses” and not clans (i.e. The House of Bruce, The House of Gordon). However, some Lowland and Border Houses have begun the modern practice of calling themselves clans. This is neither correct or incorrect, but it is certainly not historical. MacTavish CLAN/FAMILY NAMES: Cash, Holmes, Kash, Kaish, MacAishe, MacCamish, MacCash, MacCavish, MacComb, MacCombie, MacComich, MacComish, MaComie, Macomie, MacCosh, MacIltavish, MacIlTavish, MacLaws, MacLawes, MacElhose, MacLehose, MacTais, MacTaus, MacTauais, MacTavish, McTavish, Mactavish, Mactavis, M’Tavish, MacTawes, MacTawis, MacTawys, MacTawes, MacTeague, Stephens, Stephenson, Stevens, Stevenson, Tavish, Tawes, Tawse, Tawesson, Tawis, Teague, Thom, Thomas, Thomason, Thomasson, Thompson, Thomson, Tod, and Todd, and all variant spellings are welcome to join us in celebrating our shared Scottish Highland heritage. Cavis, Cevis, Cavish, Kavis, Kavish, Kaviss, Hawes, Haws, Hawson, Haweson, Hawesson, Hawsone, Holmes, MacAves, MacAvis, MacAvish, MacAwis, MacAwishe, MacAws, MacCaueis, MacCauish, MacCause, MacCavis, MacCavish, MacCavss, MacCaweis, MacCawis, MacCawes, MacCaws, MacCevis, MacClavish, MacGavish, MacGilchois, MacGilhosche, MacGillhois, MacHomais, MacHolmes, (less often McHomes), MacIlhaos, MacIlhois, MacIlhoise, MacIlhose, MacIlhouse, MacIllhois, MacIllhos, MacIllhose, MacKawes, MacKilhoise, MacKillhose, MacKlavish, MacKlehois, Makavhis, Makawis, Makcaus, Makcawis, Makcaws, Makcawys, Makgilhois, MacCevis, MacLawes, MacLaws, MacLehose, MacTaevis, MacTamhais, MacTause, MacTaveis, MacTavish, MacTawisch, MacTawys, MacTeague, MacTegue, MacThamais, MacThamhais, MacThavish, MacThomhais, McTavish, Makgilhoise, Micklehose, Mucklehose, Taes, Tais, Taise, Taish, Taiss, Tam, Tameson, Tamesone, Tamson, Tamsone, Taus, Tauis, Tauise, Tauison, Tavis, Tavish, Taweson, Tawesson, Tawis, Tawes, Taws, Tawse, Tawseon, Tawseson, Tawson, Taweist, Tawst, Tawus, Thomason, Thomasson, Thomassone, Thomassoun, Thomessone, Thompson, Thomson, Thomsone, Thomsoun, Thomsoune, Thomsson, Tomson, Tomsone. Please be cognizant of the fact that not all persons bearing Tom or Thomas patronymics belong to Clan MacTavish, or for that matter, do they all belong to one particular clan, as Tom, Thomas, Tommie, and similar given names were widespread, and those given names often became surnames at a later date. The original, or near original, name of a MacTavish ancestor might be retained in one parish, when an Anglicized, or slightly different version of the same name would show up in the same or a neighboring parish. In some instances multiple variations of names occurred in the same district. Names often reflected relationship and origin, and sometimes occupation, or a marital alliance. 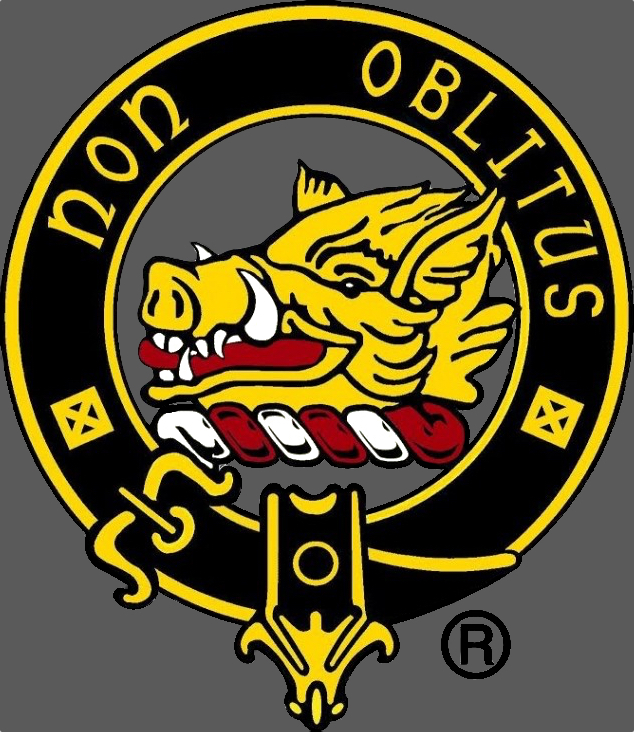 The main surname of the clan is most often the surname of its Chief, and all other surnames that came into use within the clan, came to be called septs, vassals or followers; which are now more commonly called Associated Family Names. A follower does not necessarily mean that a person or family actually belonged to a given clan. “FOLLOWERS” in most cases were persons, families, groups or even another clan which shared common beliefs and were in agreement with larger or more powerful clans who activities and politics aligned with their own. The designation “sept” was given to persons who are linked to a clan, but may not share the same surname or bloodline of its chief. These persons may, or may not, be related family members of the chief of the clan. For those who shared a bloodline, but carried a different name than that of the chief; and that name was often the name of a brother, uncle, cousin or other family member. In many instances a sept name was derived from an ancestor within the clan, or it may be a Latinized or Anglicized version of an original Highland Gaelic name. Septs may be thought of in terms of – being connected, and the phrases “Associated Family Names” or “Connected Names” may be rightly exchanged for the word sept. The old sept names may appear associated with more than one clan, where people moved and sought protection under another family leader or clan. On the Isle of Man, the Mac and first letter of the patronymic was often dropped. For example MacTamhais -G (MacTavish), the MacT was dropped entirely and replaced with a “C” or “K”, altering the name to such spellings as Kemhish (Kemis), Kemmish, Kavis, Kevish, Kewish or Cavish. MacAishe, is a spelling found for MacTavish of Dunardry in court files dealing with The Earl of Argyll’s participation in the Monmouth Rebellion. MacCaishe is found in connection with Angus Og McDonald, and is also spelled MacTavish in related documents. Hector MacCaish or MacTavish of Kinnibus, was ‘Mister Household’ to Angus Og McDonald. MacCamish, MacCavish, Caishe and Cash, etc., are altered surname forms. When the “T” of Tavish is missing and replaced with a “C” (MacC), this alteration is indicative of an elided surname. MacComish, MacCammish, MacHomais, etc., are forms of MacTavish in the Northern Irish and Scottish Gaelic dialects. Thomson, and similar Tom surnames, have been claimed as “septs” by diverse clans for several centuries. What does this signify? It simply means that at some time, families may have altered their surname spelling from its Gaelic form, or became associated to a specific clan for protection. It may also mean that some ancestor in the past named Thomas, or Tammas, gave his name to his descendants as a surname. In the case of Clan MacTavish, Tom surnames are derived from the Gaelic MacGilleTamhais, shortened to MacTamhais, modernly MacTavish. 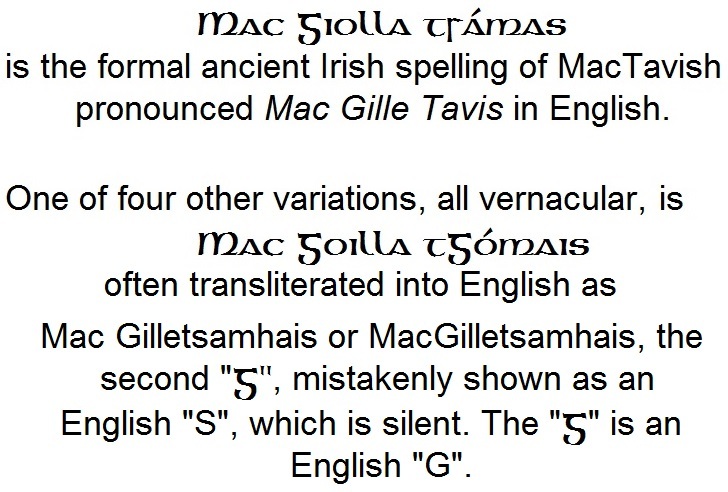 MacGilleTamhais means – Son(s) of the Devotee of Saint Thomas the Apostle, and then Anglicized, or turned into an English equivalent. Ancient Gaelic names bearing Gille, are explicitly followed by a saint’s name (i.e. MacGillePadraig, or Son of the Devotee (or servant/follower) of Saint Patrick). Mac or Mc: Mheic, Meic, Mac or Mc (there is no difference) is used in two different contexts. Mac (literally means “son”, equated to ‘son of’ in English) and may identify an individual, or it can mean all who descend from one person of that name (i.e. a clan). Mac and Mc bear the exact same meaning in Ireland as in Scotland. There is no actual national preference in usage between the two spelling variations. Mheic and Meic are the ancient spellings of Mac. The first Thomson variation found so far and connected with Clan MacTavish was John Thomson, invariably Ian MacTavish, in Kilmartin, Glassary, who was a witness to a Land Charter for the MacTavish lands of Dunardry in 1533 AD. John Thomson’s, MacTavish family, has been traced to Rudle farm, anciently a MacTavish property. In the case of Tod and Todd, the connection is since the 12th century, where they were bound up into the clan as fox hunters, archers and warriors (Tod Bunter or Tod Hunter are early variations), the name is originally of Lowland origin. Some changed their name to MacTavish. West Highland Todds belong to Clan MacTavish, but elsewhere may belong to the House of (Clan) Gordon. MacLehose, MacElhose, MacIlTavish, MacLaws, etc., are forms of MacGilleTamhais. MacTeague, is a traditional sept of MacTavish from time immemorial. The Steven (s) (son)/Stephen (s) (son) surnames were accepted in the normal practice of an adopted (sept), by persons of these names, via a request to one or more chiefs. (Note: In the Highland Gaelic Language, “ph” may be pronounced as an English “v”. Steven Highland patronymic names occurred originally in the Erse or Irish, as MacStiban, MacSteaphan or MacStiven, or a variation thereof, and were frequently seen written in Scottish records in an “Englished” form like, Stiven or Stivenson. The surname Holmes in Clan MacTavish is derived from an altered surname form found in a Northern Irish and Scottish (Gaelic) dialects. Originally MacGilleTamhais, then MacTamhais, but altered to MacHomais, and shortened to the Anglicized to Holmes. Gaelic: Homais (Thomas) – phonetic transliteration: Holm – es (the consonant ‘l’ is silent), phonetic English: Homes. These people are not connected to the Lowland Holmes families. This name is now more frequently found in Northern Ireland, in the USA, Canada and elsewhere, more so than in Scotland. Male DNA (Y-DNA) testing can determine which family line, Highland or Lowland, a person finds his origin. Clan MacTavish updated their profile picture. Clan MacTavish updated their cover photo.